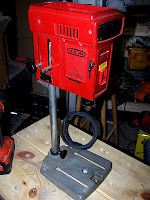 In this entry I talked about the Craftsman 8" Drill Press model 315.11970 that I had purchased off eBay. Since I've been doing some turnings, I've needed to use a drill press to make accurate holes in the workpieces. Too bad I don't have a press capable of drilling accurate holes! I mentioned that it was "unstable as hell". I recently took it apart to determine why it was so unstable. After all, who would sell a drill press that's unstable when new? I found that the red plastic housing is the entire framework. There is no metal to metal connection between the drill motor and the post. Note to engineers: Cheap plastic does NOT provide rigid connectivity in a power tool! I made a slight improvement by wedging a piece of wood scrap into the tool between the post bearings and the plastic housing. It helped, but not much. As far as I'm concerned, this thing is completely useless. I get more accurate holes using a hand drill. If anybody wants to donate something that ISN'T a complete piece of crap, I'd be more than happy to accept!